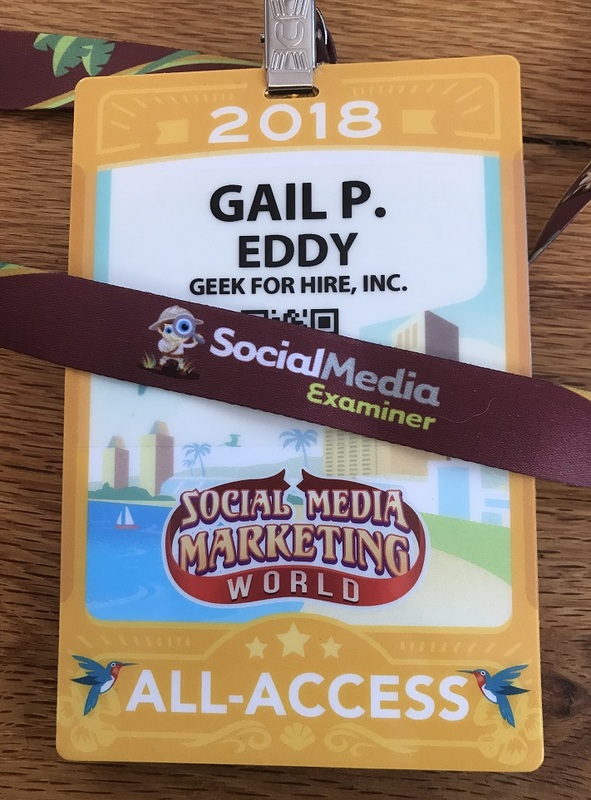 The first few days of March saw me in San Diego at the annual Social Media Marketing World hosted by Social Media Examiner. I learned so much and hope to pass some of that information on to you. If you have a website or blog that you want people to find, read on! Probably the most important thing I learned is that your website must be optimized so that search engines, primarily Google, can find you. 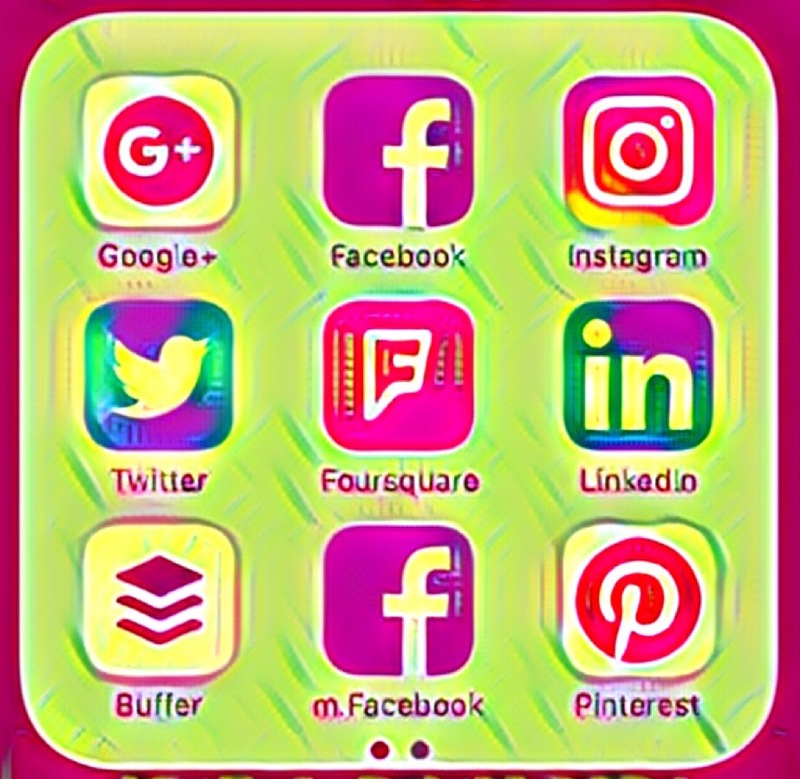 It doesn’t really matter how much you’re posting on Facebook, Instagram, and Twitter. Unless you already have major name recognition and a huge fan base, people will find and follow you on Social Media via your website. Finding your best keywords is an art. And “Key Word” is a bit of a misnomer. Your “Key Word” is actually a phrase that people would use to find you. Some tools to get you started include Google Keyword Planner, Ahrefs, and SemRush. Another thing to know about is Long Tail Keywords which are much, much longer phrases and not just a word or two. Think about it. Do you want someone coming to your site because they typed “hiking boots” into the search box? Or would you rather have someone who types in “Scarpa Terra GTX size 42”? The first person is browsing; the second is ready to buy. A good tool here is the LongTailPro and the KWFinder websites. It’s important that your business can be found on different directories. This is especially important for a local business. Moz can help you see which directories have you listed, where you have incomplete or inconsistent info, and gives you links to help correct any errors. I like Moz because they basically show you what you need to do yourself (for free!) to get listed. But they also have a (reasonably priced) service to do all the leg work for you. Another thing that helps your site rank higher with Google’s analytics is to have plenty of back links. Many of the presenters at Social Media Marketing World expressed the importance of back links. A back link is a link on another webpage that links back to your site. This does need to be done carefully and strategically however. The site that is linking back to you has to have a good reputation. A site that only lists back links, usually done for a price, will actually make your site rank lower as a result. Backlinko helps you strategically make a plan to get quality back links. Remember: If you can’t be found, you don’t exist! The other day I was thinking about new shoes. I went to Google and typed in “Keen Mary Janes”. Now, all I see when I’m on my computer (and phone!) are ads for Keens and ads for Mary Janes. So much for my online privacy… I keep wondering if I do decide to buy them will the ads disappear and I’ll start seeing ads for a different product that I’ve Googled. I’ve been thinking a lot about privacy lately, ever since the House & Senate passed a bill last month in favor of blocking internet privacy rules. You can read more about that here. This bill essentially gives Internet Service Providers more leeway in selling our searching info to advertisers. There are ways to keep our data more private, one of them being setting up a Virtual Private Network (VPN). That’s a little over my head, so I’ve asked Chris to write a blog about that. In the meantime, there are four pretty easy ways of keeping your searching history more private. Online Privacy – What can you do? Well, you could just stop using the Internet. No more email. No more Facebook and other Social Media. No more online shopping sprees. No more checking the news online. Yeah, like that’s gonna happen! Do all of your shopping in person. With cash. Without signing into the store’s reward program. A good friend of mine once went to a store and bought a pair of pink Ugg boots for a friend with cash. Unfortunately she did use the store’s reward card. For weeks afterwards she got ads on her computer for Uggs! You can go to your local library. As long as you don’t sign in to your email or any other account, your online privacy is maintained. You can search for anything while you’re there without worrying about what your ISP will see. 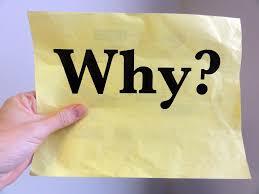 You can print off the relevant pages, fork over 10¢ or 20¢ per page, and be on your way. “WhatsApp’s end-to-end encryption is available when you and the people you message use the latest versions of our app. Many messaging apps only encrypt messages between you and them, but WhatsApp’s end-to-end encryption ensures only you and the person you’re communicating with can read what is sent, and nobody in between, not even WhatsApp. This is because your messages are secured with a lock, and only the recipient and you have the special key needed to unlock and read them.” Here’s the link to download WhatsApp to your Smartphone or tablet. It’s easy to change your default search engine on the iPhone to DuckDuckGo. Click on the Settings icon, then scroll down to Safari. Click on Safari and select your preferred Search Engine. 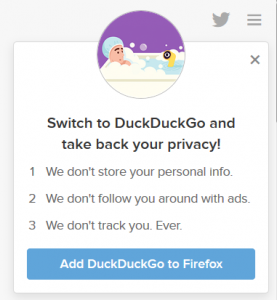 On your computer, just bookmark the DuckDuckGo page and use it whenever you do a search. I’ve been using it for a few weeks now and am not noticing a difference in the quality of responses to my searches. Using DuckDuckGo and WhatsApp doesn’t protect you 100% but it does help you maintain some online privacy. Have you downloaded the new Pokemon Go App yet? Are you playing it? It seems to be taking the nation by storm! You can find out all about it at the Pokemon website: http://www.pokemongo.com and you can download it from the iTunes store or, for the Android from Google Play. Pokemon Go players go mad. Falling, tripping, and other mishaps. Another teen found a missing man who had recently died. Businesses have realized they can use Pokemon to their advantage. In fact, this Forbes article is full of ideas that businesses can use to lure in more Pokemon players – and potential buyers! In fact there’s even a guide for people who want to do interval training! Is it all just a mad scheme? How long do you thing this craze will last? I don’t know about you, but my Facebook is getting full of posts about politics. Sometimes I agree with my Facebook friend, and sometimes I don’t. Sometimes the posts are downright offensive! I have a trick I use to minimize the number of times I see those offensive posts. It also helps minimize the times that those people can see my posts and start trolling. 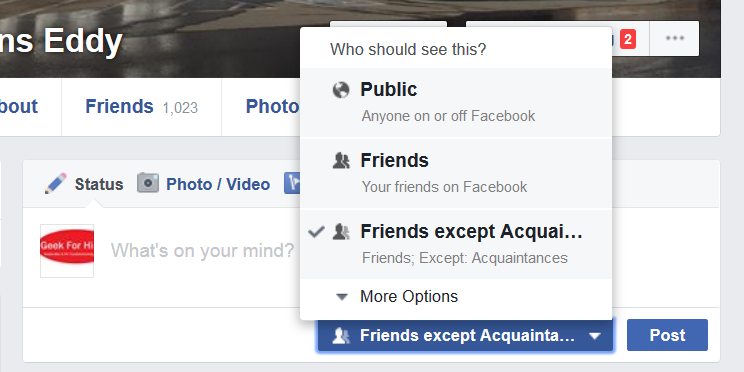 Bring up the person’s Facebook page and click on the down arrow next to the “Friends” button. 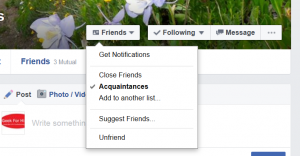 Then click on “Acquaintances” and make sure the “Get Notifications” option is unchecked. 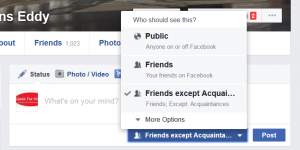 Remember that Facebook uses algorithms to figure out what to show you. 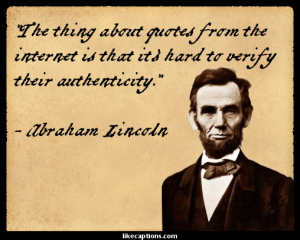 If you check out that person’s page, it is more likely that their posts will show up on your feed. Facebook needs to be trained! 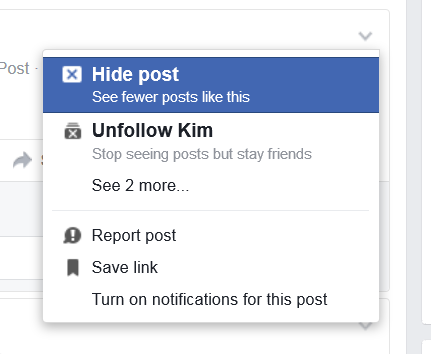 If something does show up on your feed that you don’t want to see, click the down arrow on the right side of the post and select “Hide Post”. You’ll get another pop-up after clicking on “Hide post” that looks like this. Here you have another choice. Do you want to see less from that particular person? Or do you want to see less from their source. Click on your option and continue on your way through your news feed. 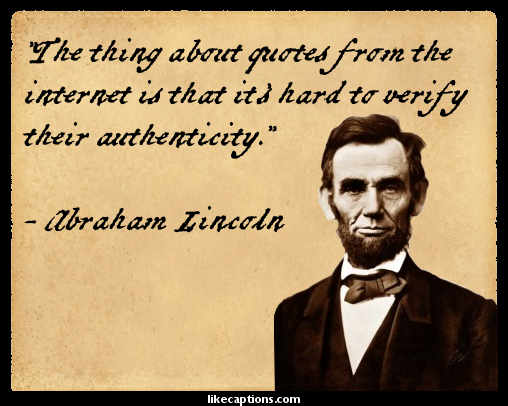 Sometimes it’s good to minimize who sees your posts as well. Now, that will be easy for you to do. When you post a news story or your own opinion that may be controversial to some, you can select who gets to see it. Click on the down arrow to the left of the “Post” button and select who can see this post. 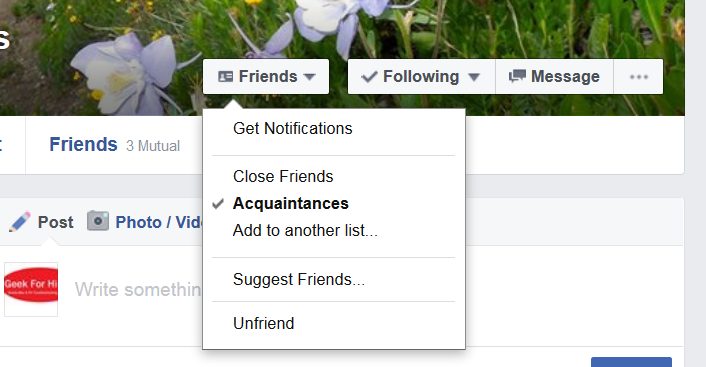 If you select “Friends except Acquaintances”, then all the people you’ve categorized as Acquaintances will not see that post. I hope these tips help you keep your sanity through this election season! Today was one of those days. According to this article in arsTechnica, the US Customs and Border Protection is considering adding a new field to their Visa application process. They will be asking visitors to the US to provide their Social Media Identity. Apparently it won’t be a required field, but if you leave it blank, it will look very suspicious. So, someone who is not paying attention may provide not just their ID, but might also provide their login and password info! First, of course, is that anyone can find anything online, so adding a box on their form will just make the process a little easier for Customs to get your info. Second, how will Customs keep this info safe? How will they insure that someone can’t hack into their systems and capture the info – especially if some of those applications may contain ID’s and passwords? Lastly, how will this help? Call me cynical, but I don’t think someone entering the country with malicious intent is likely to be providing their “real” social media identity. It is far too easy to set up multiple identities online. Just look at me. I’ve got an email for business, an email for personal stuff, an email for networking, and an email for signing up for stuff online. It was easy to do this. 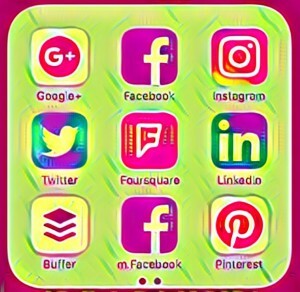 And once you have different emails, you can set up different social media accounts. No, those folks will be providing their ”professional” social media account; the identity they use for LinkedIn to show that they are an upstanding citizen of their home country. I fail to see how this new field on the visa application will keep out the “bad guys”. What are your opinions about online privacy and multiple identities? We’d love to hear your thoughts! This morning, I was doing one of my morning rituals which includes reading through the recent posts on Facebook, and found that a friend of mine who lives on the east coast, liked a story. I worked with him many years ago. He was the manager of a major project which I worked on for many years. This was the largest project in my career, and I know that this system is still “alive” today because I have served a local customer twice who is dispatched by this system. Since I respect my friend, and he doesn’t casually like everything, the things that he does like tends to get my attention. The first thing I did was to like the story too. The story told of a mother beating her son on national television because he was participating in the recent riots in Baltimore. My friend liked it, so it must be legit. I clicked on the link to the story, which went to a blogsite which I had never seen or heard of before. The content of the page had only a brief retelling of the title of the story, plus several advertisements, but there was no link to the salacious original video that grabbed my attention. Since I didn’t see what I expected, I thought this was a problem with the tight security settings of my daily browser (Firefox, with several add-ons), so I copied the URL from my “high security” browser and pasted it into my “low security” browser which works with everything (Internet Explorer), and fetched the page. The same page was displayed, but this time with many popup advertisements (pop-over and pop-under) which were really concerning to me. There was no salacious video or a link to it. I shut this down fast. Still being interested in the salacious story, I went to YouTube and searched for the general words of the title of the story, and found several direct links to the video – without additional advertisement or commentary. In this case, I fell prey to “Click Bait”. I saw a story that interested me, thought it was legit, and clicked on it. It wasn’t legit. I will be doing a total system scan of my computer to check for any residual nastiness. If you think you’ve fallen prey to “Click Bait”, the best thing to do is to scan your machine for anything malicious. If you need help, give us a call! Chris Eddy of Geek For Hire, Inc. has been providing computer service to families and small businesses with Mac’s and PC’s for the past fourteen years. His company is highly rated by both the BBB (Better Business Bureau) and by Angie’s List. You can find more at http://www.GeekForHireInc.com Geek For Hire, Inc. provides onsite service (Tier 3) to the Denver / Boulder / Front Range area. They can provide remote service throughout North America.